We are happy to announce a new and innovative treatment to aid with smoking cessation at our Physiotherapy Clinic in Naas, and at our Vista Primary Care Clinic in Naas. Using low level Laser Therapy on points, similar to acupuncture points, we can help you STOP SMOKING in just 4 quick treatment sessions. It is completely safe, pain free and even relaxing! A soft laser beam is applied to specific points of the body and stimulates the body's production of endorphins. Endorphins are a natural body chemical that have a calming and relaxing effect. When you stop smoking there is a decrease in endorphin levels, which leads to cravings and withdrawal symptoms. Our treatment will help you beat those cravings, as well as reducing stress and helping with lung detoxification. Also, there is no unwanted weight gain usually associated with smoking cessation, so this really is a quick and easy solution to beating the habit! Advice and support are also given throughout the treatment and the smoking cessation programme is individually tailored to suit your very own needs. The most important factor is the DESIRE TO STOP! 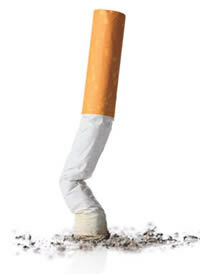 Low level Laser therapy is scientifically proven to help you quit smoking! If you wish to stop smoking, or would like more information, please contact us today to book your appointment- 045 848731/085 7757985.